The World Tableware BW-5211 is a round plate with a large, shallow well in the center. This plate is 113⁄8 inches in diameter, making it ideal for use as a dinner plate. 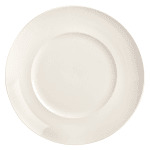 The bright white color will help the plate blend in seamlessly into almost any dinnerware set. The plate is dishwasher and microwave safe to make usage as convenient as possible.